It is common for us as lay people to have a negative reaction to sales. We are wary of the tales of those fleeced on used car lots. We easily conjure an image of the smarmy salesman in his tweed jacket, upselling us products we don’t really need. 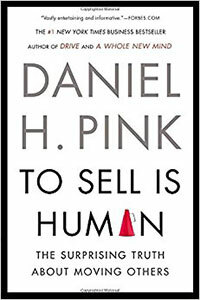 In an age when many have forecasted the death of the salesman, Pink reverses the prophecy, asserting that we are all in sales now. More and more we own our own platforms. We are a part of the network of social reviewers, promoters, or detractors. Sales, or moving others, extends into many areas of life. We try to teach others concepts and encourage their application. We try to persuade our teams that certain ideas have merit and warrant implementation. We try to encourage our children to walk a path of upright principles in their own lives. Sales doesn’t have to by a hiss and a byword. By our own actions, in our own selling, we can be the sales people we want and need to be.